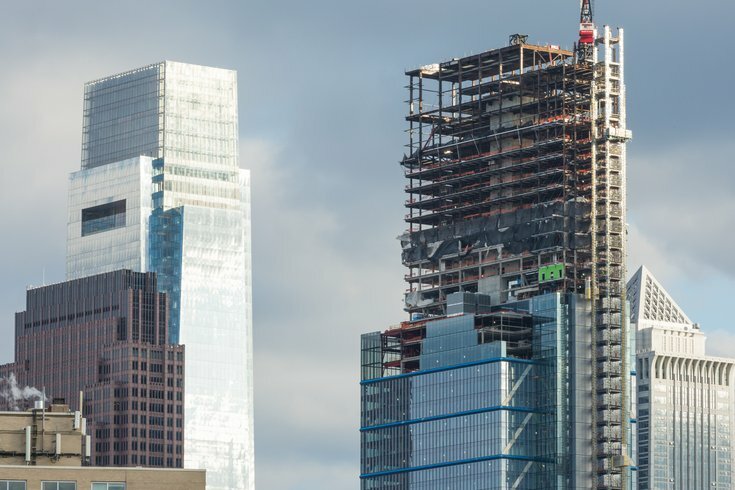 The Comcast Center, left, and the under-construction Comcast Technology Center, which will eventually rise to 1,121 feet and replace its corporate sibling as the tallest building in Philadelphia. It will also be the tallest skyscraper in the Western Hemisphere outside of New York City and Chicago. The Comcast Technology Center is poised to celebrate its ascent to the highest point in the Philadelphia skyline. A topping off ceremony is expected to be held sometime this fall, when the final beam is set in place on the 60-story skyscraper. No date has been announced yet, but the skyscraper is nearing completion. The building, designed by Foster+Partners and developed by Liberty Property Trust, has steadily risen since workers broke ground at 18th and Arch streets three years ago. When the $1.5 billion project is complete – sometime in 2018 – the Comcast Technology Center will include a luxury Four Seasons hotel, a restaurant on its top floor, and additional retail space. At 1,121 feet, the skyscraper will be the tallest building in the Western Hemisphere outside of New York City and Chicago. It will stand nearly 150 feet higher than Philadelphia's next tallest building, the Comcast Center, its corporate sibling. The Comcast Technology Center will mark the third office building to hold the title as the tallest in Philadelphia. Before that, a mixture of churches and municipal buildings held that distinction. The Comcast Center in Center City, Philadelphia. 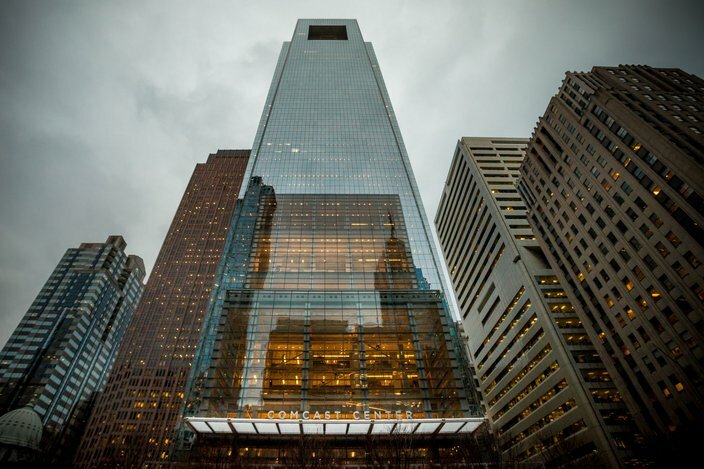 The Comcast Center ascended to the top of Philadelphia with considerably less fanfare – or controversy – than the two buildings that preceded it as the tallest in the city. Completed in 2008, the glass skyscraper sat nicely amidst similar glass high-rises, even if its shape resembled the popular flash drives of a decade ago. But the Comcast Center was not initially designed to stake claim as the city's tallest building. When the late real estate developer Willard Rouse III proposed a new skyscraper in 2000, he envisioned the so-called One Pennsylvania Plaza would rise 745 feet, complete with a golden Kasota stone facade similar to the Philadelphia Museum of Art. As Comcast sought to become the building's lead tenant, the design changed. The proposed tower grew to 840 feet, but scrapped the stone facade. By the time Comcast signed a lease agreement, the proposed building had grown to 975 feet, with a squared top and reflective glass facade. One of the more environmentally friendly skyscrapers in Philadelphia, the Comcast Tower uses 40 percent less water than a typical office building. A glass curtain blocks 60 percent of heat, but allows sunlight, reducing the energy used for air conditioning. The Comcast Center also features a 2,000-square-foot LED screen in its lobby. It serves as a popular spot for visitors during the holiday season, when the screen features a free, 15-minute show known as the "Comcast Holiday Spectacular." The tower of One Liberty Place soars behind City Hall. One Liberty Place reshaped the Philadelphia skyline, transforming it from a nondescript collection of buildings clustered around City Hall to a modern cityscape lined with gleaming, post-modern towers. 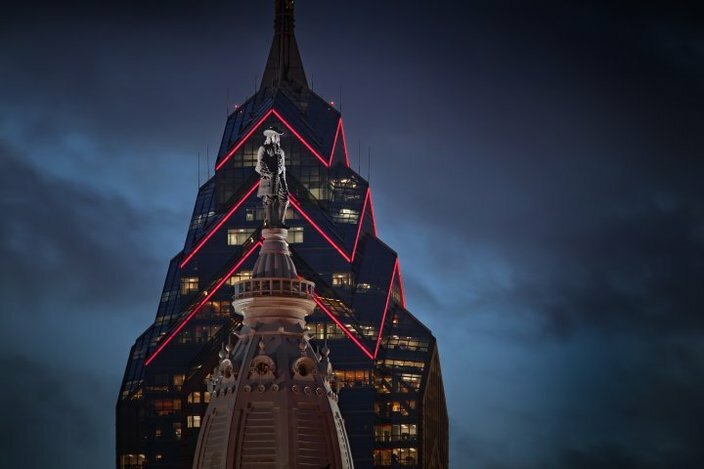 One Liberty Place became the first skyscraper to rise beyond the William Penn statue atop City Hall, breaking a gentleman's agreement that sought to preserve the statue as the city's highest point. Naturally, the skyscraper sparked considerable controversy in the mid-1980s. Former city planner Edmund Bacon spearheaded a vocal opposition campaign, claiming One Liberty Place would decimate the scale of Center City. But Rouse had the support of Mayor W. Wilson Goode and city council. Inspired by the Chrysler Building, architect Helmut Jahn designed a post-modern skyscraper cast in blue glass and granite, topping it with a terraced a series of setbacks. Other skyscrapers, including a sister tower, soon followed. Within five years, Philadelphia boasted seven buildings taller than City Hall, all located within the city's business district. The new skyline drew positive reviews from the New York Times' architecture critic. But it eventually absorbed the blame for Philadelphia's failing sports team. Until the Phillies won the World Series in 2008, no major sports team had celebrated a championship since One Liberty Place surpassed Billy Penn's hat. Some believed the city's franchises were subjected to the so-called "Curse of Billy Penn." Upon the completion of the Comcast Center in 2007, a statuette of William Penn was attached to the building's final beam. One year later, the Phillies paraded down Broad Street. The view of City Hall from the Residences at the Ritz-Carlton. City Hall, best known for the William Penn statue that tops its clocktower, towered over Philadelphia for the better part of a century. It briefly stood as the tallest structure in the world, until being surpassed during construction by the Washington Monument and Eiffel Tower, and remains one of the most identifiable buildings in Philadelphia. But it was not always so beloved. The construction of City Hall, which stands 548 feet tall, was an arduous process. And the planning process was no easier. For decades, city officials debated the location for a new municipal headquarters, weighing Independence, Penn and Washington squares as possibilities. Once construction finally began at Penn Square, in 1871, it took another 30 years to complete. By that time, architect John J. McArthur's Second Empire design was considerably out of style. In a city of red brick rowhomes, the marble building was considered excessively large, ornate and white. It dramatically altered a skyline once topped by church steeples. Stretching into the 1950s, city officials, at times, considered tearing down the building. But doing proved cost-prohibitive, so the building stayed upright. In time, it grew into a beloved city landmark. 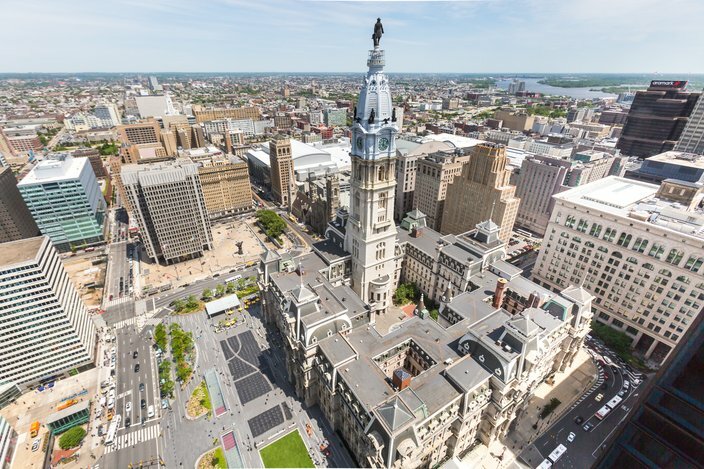 City Hall – the largest municipal building in the country – contains nearly 700 rooms and more than 250 sculptures, including the famed 37-foot bronze statue of Penn, the tallest atop any building in the world. During the 1990s, Penn was adorned with a Phillies cap and a Flyers jersey as the two teams played for championships. But both teams fell shy of a title. Tenth Presbyterian Church once had two spires, including one that rose 250 feet. But they were torn down in 1912 due to structural damage. The present-day church building is seen at right. The needle-like spire that once rose 250 feet above the ground no longer stands, but Tenth Presbyterian Church still holds its services inside the building. Tenth Presbyterian, originally located at 12th and Walnut streets, constructed the building to house an offshoot congregation known as West Spruce Street Presbyterian Church. 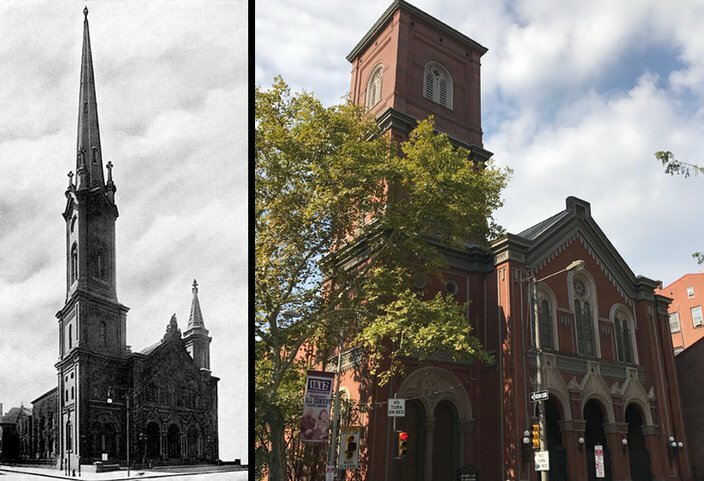 The new building at 17th and Spruce streets initially was designed in Romanesque style by architect John J. McArthur, a deacon at Tenth Presbyterian. At the time, the city's population was moving westward, with nearby Rittenhouse Square developing into the city's poshest neighborhood. When the two congregations later merged in 1893, they opted to hold services at the newer building but retain the name of the original congregation. Following the merger, architect Frank Miles Day redesigned the church in the Byzantine style it retains today. The church removed its spires in 1912, including the taller east tower, fearing that they might collapse due to structural damage. Location: 20 North American St.
Christ Church, a popular house of worship among leaders of the American Revolution, stood as the tallest building in Philadelphia for more than a century. The church's notable white steeple – long desired by the colonists who settled in Philadelphia – was added in 1754, nearly three decades after construction on the church first began. Benjamin Franklin, a church parishioner, organized a lottery to finance the steeple, which remained the tallest structure in the 13 original colonies for 56 years. The Georgian-style church was dubbed "The Nation's Church" because of the many Revolutionary figures who worshiped there. Five signers of the Declaration of Independence and seven signers of the U.S. Constitution, including Franklin, are buried in its cemetery. Christ Church, which still holds services, also marks the venue where Absalom Jones became the first black priest in the Episcopal Church of the United States and where, at one point, 25 percent of the city's free and enslaved black people were baptized. The building's interior, redesigned in the 1830s by Thomas U. Walter, the architect of the U.S. Capitol, includes a chandelier installed in 1740, a pulpit built in 1769 and a 1300s-era baptismal font from the London church where William Penn was baptized. It is here that the Declaration of Independence was signed in 1776; the Articles of Confederation, uniting the 13 colonies, were ratified in 1781; and the U.S. Constitution, outlining the nation’s basic laws, was adopted in 1787. The Great Essentials exhibition in the west wing of Independence Hall displays the original inkstand used to sign the Declaration and the Constitution. Independence Hall, the most famous and recognizable building in Philadelphia, dates back to 1732, when construction began. The Pennsylvania Assembly began meeting there in 1735, even as it remained under construction. A steeple, similar to the one that now tops the historic building, was added around 1750. A bell was ordered for the steeple in 1751 and, two years later, it was recast into the Liberty Bell. By 1773, the steeple had rotted and was considered dangerous. Yet, it remained atop the building – then known as the Pennsylvania State House – as the leaders of the American Revolution signed the Declaration of Independence. But the steeple was gone by the time the Founding Fathers drafted the U.S. Constitution there, torn down in 1781. 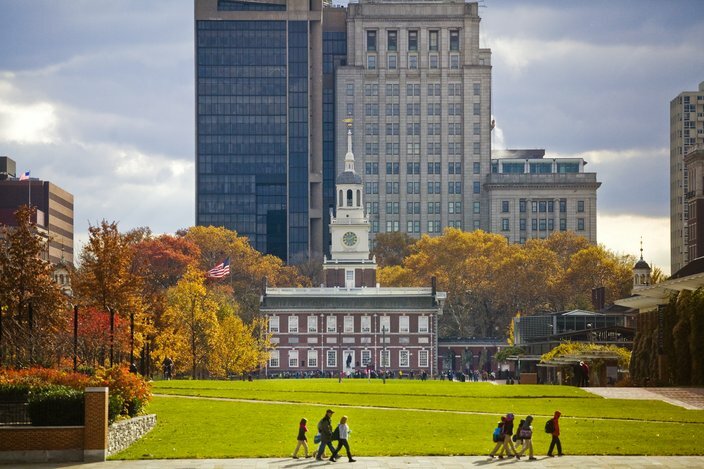 When French General Marquis de Lafayette, a Revolutionary War hero, visited Independence Hall in 1824, his much-heralded return prompted nostalgic calls for the building to be restored to its 1776 appearance. The city hired William Strickland in 1828 to restore the steeple. Strickland modeled his design after the original, but he incorporated a clock and added more ornamentation to the steeple, which stands 168 feet tall. Independence Square took on its current appearance in 1898, after the city replaced mills that had been added to the building's flanks with wings and arcades resembling those from the American Revolution.